The sciatica is a painful condition in the lower back, which goes from the waist to the feet below.Those people who suffer from Sciatica pain have a lot of problems in getting up and walking in the morning.Sciatica nerve pain is a pain in the lower part of the waist which also affects the feet due to the herniated disc in the spine, the pain starts with the roots of the nerves,the pain reaches the feet, buttocks and feels very painful during walking.This is a serious problem if not properly treated and taken care of this disease, becomes very painful and the victim is very difficult to carry out his routine activities.This pain suddenly starts and remains for some time. Symptoms of this disease are seen in 6 to 7 weeks, but due to herniation, this pain becomes very frightening. It feels as if something is stinging in the veins. Ice and hot water bake - In any type of pain, cold and hot soaking is very effective.Taking these two types of beaks in the distance gives instant relief in the pain of sciatica. Oil massage - Massage on the lower part of the waist and on a effected area provides much comfort. Exercises - In the supervision of the specialist, you should exercise for pain and soreness of the sciatica.Activities such as swimming and aerobics are also good for muscular strength. It is also helpful in reducing pain. 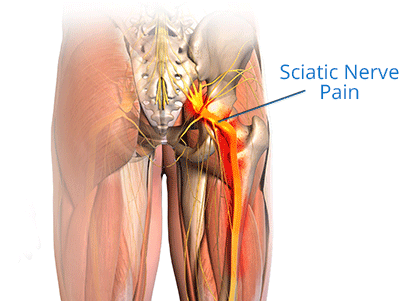 Yoga - Regular practicing of yoga provides muscle relaxance and pain relief in sciatica. Fenugreek coat - Making a paste of fenugreek seeds and apply on effective area it gives relief in pain of sciatica. These are all easy home treatments that can be done at home, it is not an expensive job. Even if you are taking medication and medicine, this natural remedy can also be adopted for early relief.